Malaysia RM5 Billion Warisan 100-Storey Tower. Worth or Not? 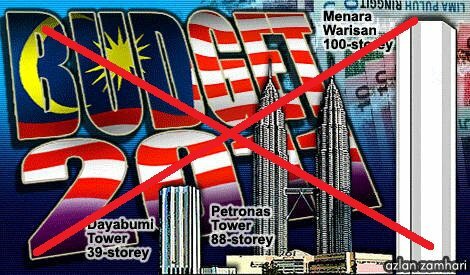 Just noticed that Malaysia's Budget 2011 is already out and noticed something that more people are opposing. When tabling Budget 2011 on Friday, Najib said that the Warisan Merdeka would be a Permodalan Nasional Bhd (PNB) project, sited adjacent to Stadium Merdeka and Stadium Negara and is expected to cost RM5 billion (that's not a small amount of money) and will be the tallest tower in Malaysia upon its completion in 2015. “Najib’s 2011 Budget is not convincing that it represents the first budget of a New Economic Model to transform Malaysia from a middle income country to an inclusive and sustainable high-income developed country by 2020, emphasising high-skilled human capital, efficient public services, a reinvigorated private sector and equal opportunity for all Malaysians,” said the Ipoh Timur MP. He also doubted if the Najib administration plan increase talents in the domestic job market would succeed due to the prime minister’s lack of political will to implement the NEM vision of ensuring equal opportunity. 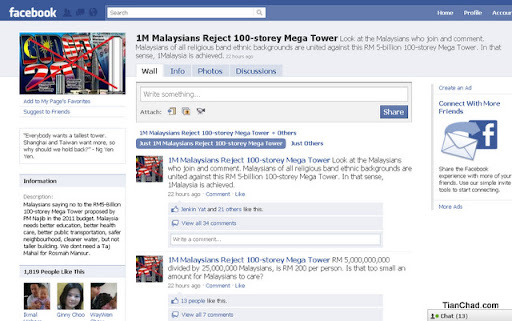 "Malaysians saying no to the RM5-Billion 100-storey Mega Tower proposed by PM Najib in the 2011 budget. Malaysia needs better education, better health care, better public transportation, safer neighbourhood, cleaner water, but not taller building. We dont need a Taj Mahal for Rosmah Mansur." Five DAP MPs from the Fedral Territories are strongly opposed to the government proposal to build a RM5 billion 100-storey commercial building in the heart of the city. They said that the building will not improve Kuala Lumpur's international standing but will exacerbate the traffic congestion in the area. Voice up your opinion by just vote at poll above. please dun build anymore building! pls GO GREEN! plant more TREES instead !!! We don't need such a tall building as landmark since we already got the petronas twin tower. Furthermore, if taipei's 101 still higher than ours. Soooo..... what's the point?